For years I've been using this stuff to clean my brushes. I blush to admit that more than once I have let my wet brushes sit longer than I should and have had to work doubly hard to bring them back to life. This product is a Godsend to absent-minded or just plain lazy artists. You can also leave it on as a final shaping aid to re-point those fine sables. 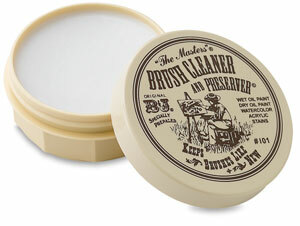 According to "The Masters" Brush Cleaner and Preserver website: "Just wet the brush and work up a lather on the hard cake. 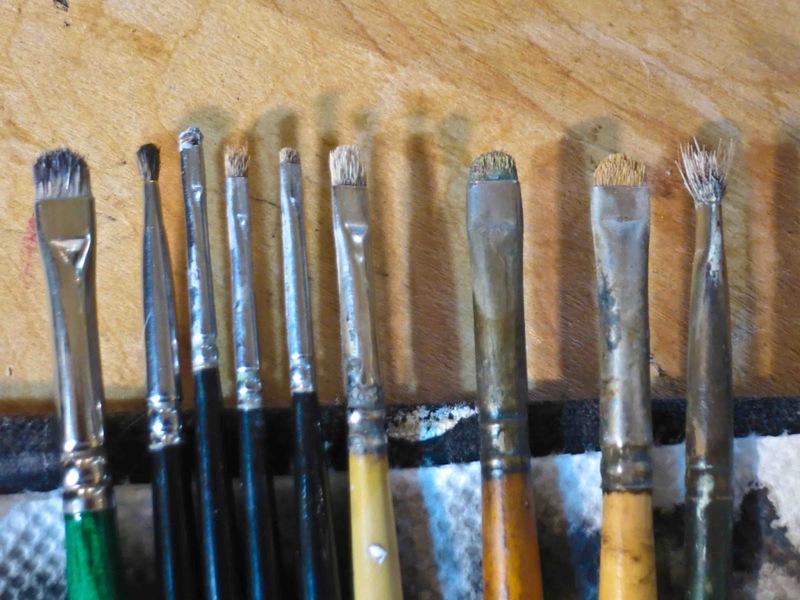 Even old, hardened oil paint brushes can be restored to their original snap and luster. 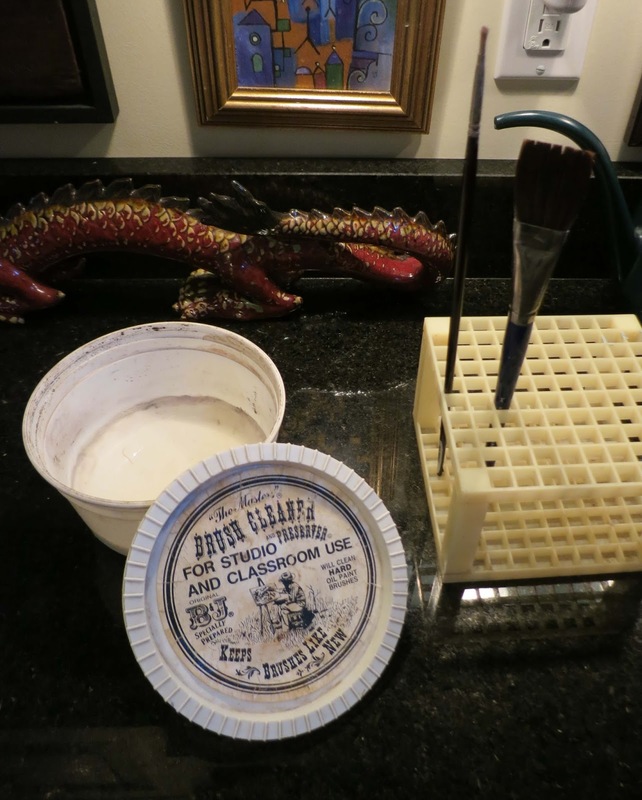 Brush Cleaner and Preserver works on most acrylics and watercolors, too. It gives off no harmful fumes or odors, and it's safe for use in the classroom or studio." I'm not so sure about their claim that it can remove "old, hardened paint," but it certainly works on brushes that have been drying for a day or two. 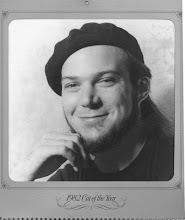 The photo above is a container that I have had for over 15 years (!) so don't let the price stop you since it seems to last forever. It also comes in smaller 2 5/8 oz cakes for about 5 bucks. 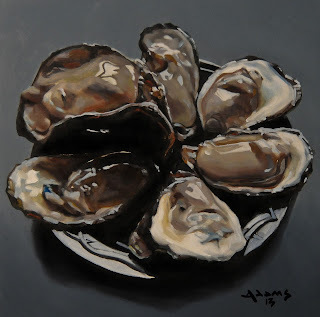 "Oysters on a black plate"
My love affair with oysters continues unabated. These local beauties, born and bred in the tributaries of the Chesapeake Bay, were presented here in all their splendor by master shucker, George Hastings, at the Hon Bar in Hampden, Maryland. They were darn tasty, too! Friday flashback - "Mardi Gras Masks"
This is another one of those paintings that came and went very quickly. 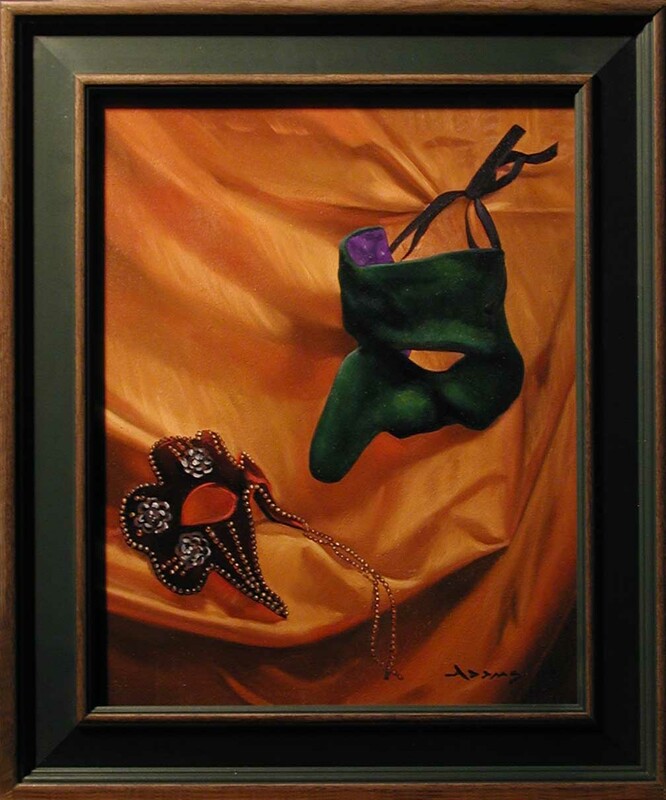 I choose this piece for today's flashback since I had taken a photograph of the set-up for this still life, which will shed some light, pun intended, on how I staged this. Enjoy. Today's Tuesday Tip - the "OptiVISOR"
The device at present around my head is known as an "OptiVISOR." It has interchangeable lenses available in focal lengths from 4" to 20" and costs about $50 depending on the lens. I use a #5 lens which has an 8" focal length good for 2.5 times magnification. 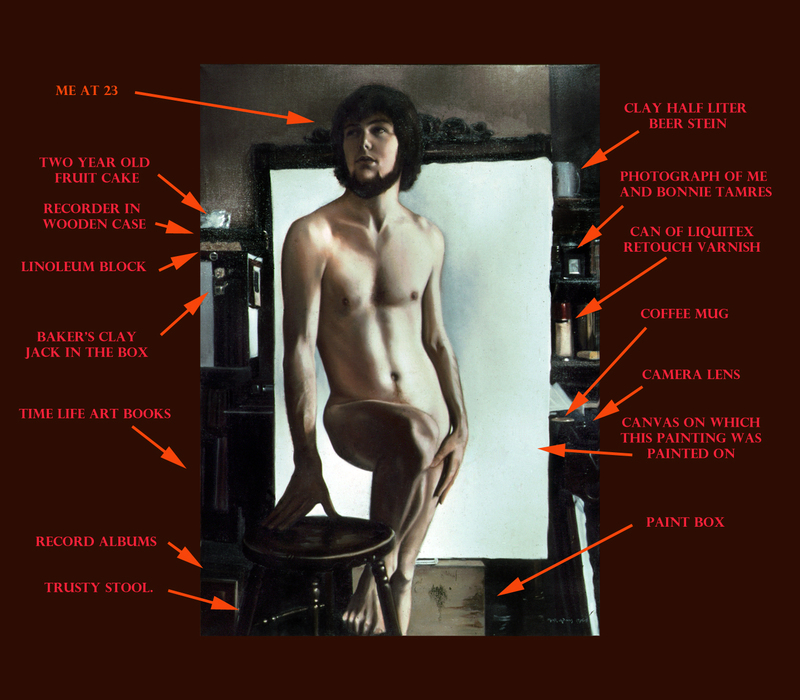 This piece of equipment is invaluable in the studio, especially if you work on small tight paintings as I do. It is also good for removing splinters, fixing broken jewelry, reading the fine print or whatever. 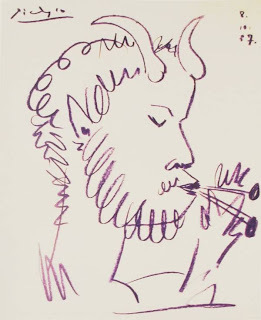 I often have a brush stuck behind each ear through the loop which gives me the odd appearance of one of Picasso's fauns. 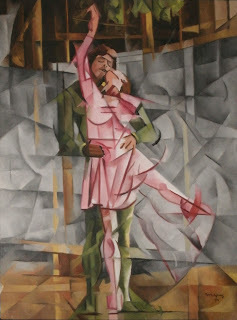 Friday Flashback - "Cubist Dancers"
This cubist pas de deux surprised even me. I recently received an e-mail from a man in Florida who attached an image of a painting that I had totally forgotten I had done. 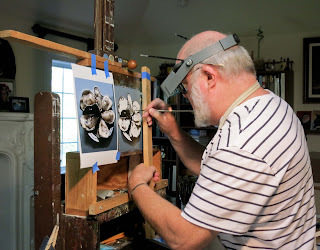 In the old days, before the advent of digital photography, I kept a seldom-used 35mm Canon FTB camera loaded with slide film to record my paintings for posterity. I would usually wait until I had a critical mass of 6 or 7 paintings before I would set up the studio lights to shoot them. 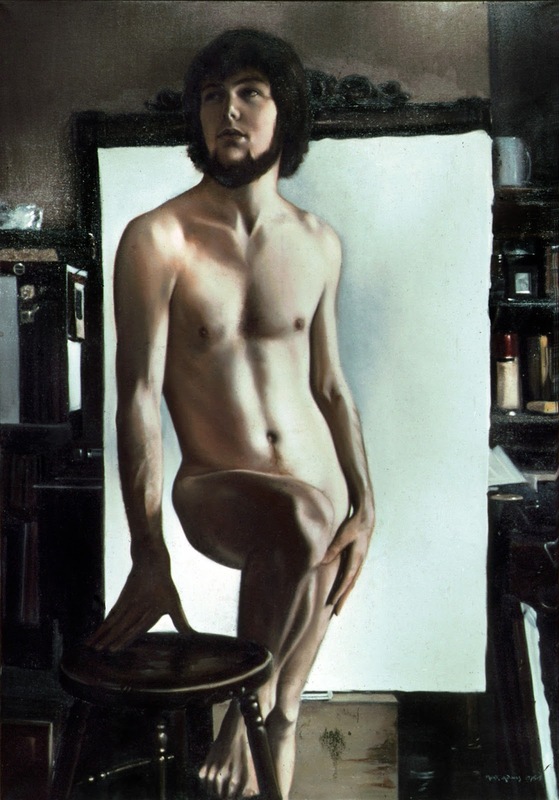 Occasionally a few slipped through the cracks due to someone coming to the studio and buying a wet canvas, no film in the camera, pure laziness on my part, etc. Such was the case with this piece. 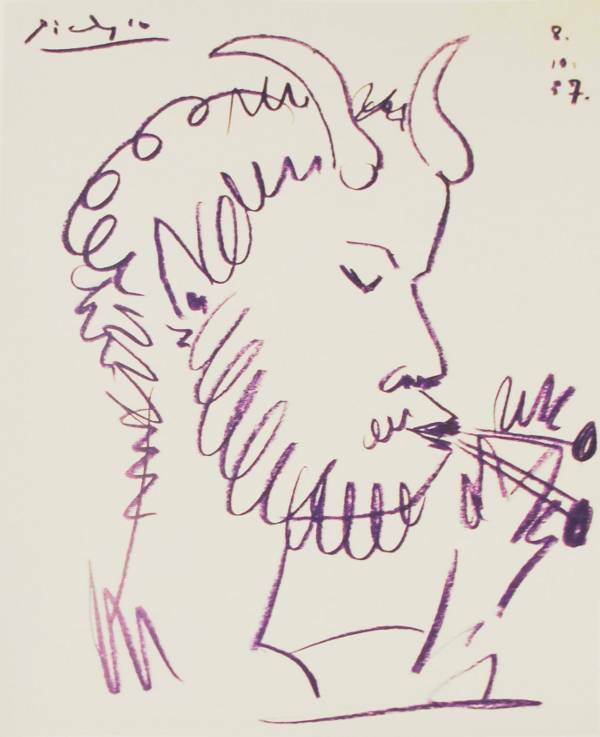 The cubist movement has always fascinated me and I was flirting with the concepts of analytic cubism a lot back in the 70's. This kinetic work clearly had futurist inspiration with a nod to Marcel Duchamp's "Nu descendant un escalier n° 2" as evidenced by the upward movement of the dancer's leg. Friday Flashback - "St. Sebastian"
And so he plays his part." 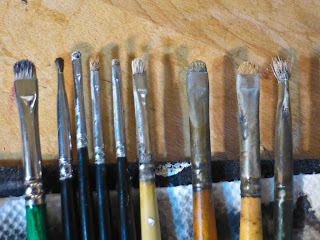 Today's Tuesday Tip - "Old Brushes"
It has been firmly established that I am a compulsive saver. Things that most normal people would have long ago tossed in the bin I hold onto in hopes of finding new purposes for. A case in point is old brushes. Many non-artist types would look at these worn out nubs and think they are totally useless - au contraire mon frere! For a painter of animals, these are instrumental (no pun intended) in creating the effects of fur and feather. You can't buy these either. They are created over time and are thus very precious. Think twice before you throw that old brush out. I am currently working on a painting of a venerable Jack Russell terrier, whose wiry, aging fur would have been very difficult to paint without the benefit of my old friends here. You'll see it posted tomorrow. 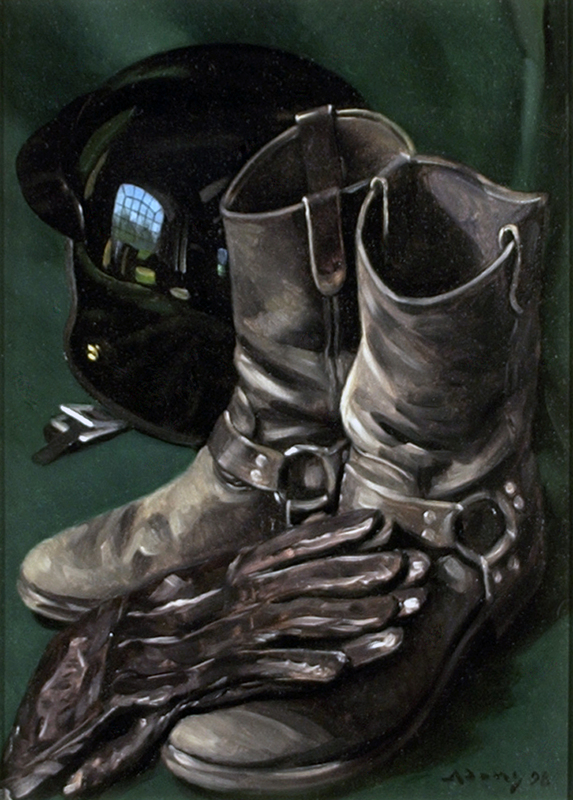 Friday Flashback - "Motorcycle helmet, boots and gloves"
Done from life back in 1998, this still life typified my other passion - riding.